Update for March 11 (2015): I've added a section on display and tips. Updated caveats. 2. "useAmbientOcclusion" should be replaced as "ambientocclusion"
3. "faceData" should be replaced as "faces"
4. "textureFacing" should be replaced as "texture"
This is how default uses it mostly. You can use other names in step 1 if you wish (for the non-particle one at least) and add more if needed. For instance, you could use #top and #side if you want those textures to be unique. 6. (optional) remove "inventoryRender3D" as it is not used anymore. Items now have their own model files, including for blocks' inventory model. 7. (optional) remove the "type" element, such as "type": "cube", as it is not used anymore. Planes don't exist anymore, now just cubes are used so there aren't cubes/planes having different data structures/options or something like that. cannot rotate elements on more than 1 axis. This makes simple stereotypical swords (with sharp edge and sharp tip) impossible to create, along with recreating cobweb in 3D. When you wish to edit a block, drag it into the same folder (mimic the structure as the .JAR) in your working resource pack folder. I do not recommend copying all of the models to your pack, this is a bad practice. Either get them from the .JAR when you need them (c'mon, it's not that much work) or drag them somewhere where you can quickly get to them. Tip! If you plan to edit many models, it is recommended that you drag the entire models folder into a convenient location, such as your documents folder. Delete this new folder and do this again if new versions with a different model format comes out. Before starting, it's important to know what you're going to do, as well as what file you need to edit. You also need to find out which model to edit which one you'd place when facing north (which puts in on the south face) which should be model3.json. You want this so you just input X&Z from your top-down image and X&Y from your front-facing image (side images give you Z and Y). While you create your image in your image editor for the purpose of coordinates, note that the formats are different. Images use pixels while the block model format uses vertices. To oversimplify it, pixels are like "faces" in 3D graphics, in that they (square faces) have 4 vertices. So, how do we accommodate for this? Well, fairly simply, when you're hovering over (to find the coordinate) a pixel on the left-top of the square (what you intend to create as a model), use the coordinate as-is. When you're hovering over a pixel on the bottom-right of the square take the pixel coordinate and add 1 to each value. 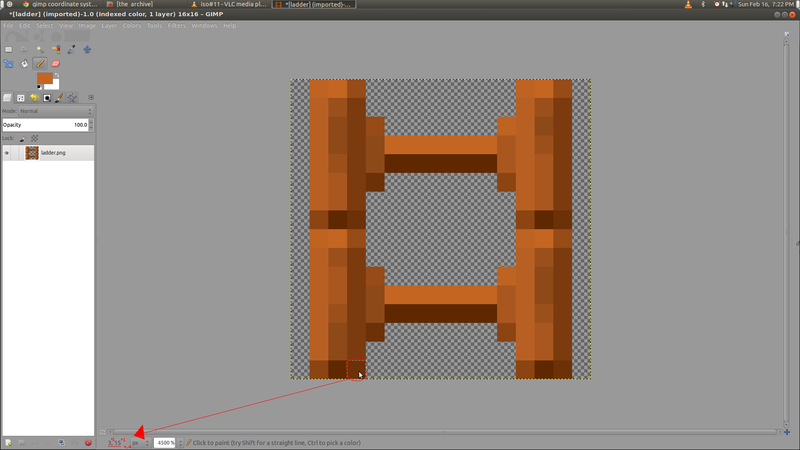 This can be easily seen with the cube model file: The top left pixel, (0,0) is used as-is, while the bottom-right pixel (15,15) when used in the model is (16,16). This applies to both model and UV mapping. Important! The model coordinate system and the UV mapping system are different. The model coordinates behave as you would logically expect, but the UV mapping system has the Y-coordinate reversed. This is why I instruct you to take coordinates from the top-left first. This will not cause problems if you have a symmetric texture as I did, aside from confusion when you thought you modelled a top element and you actually modelled a bottom one. 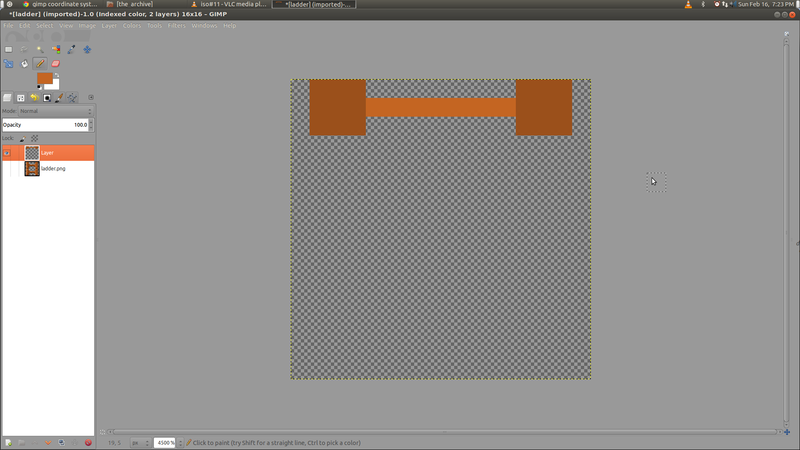 You may prefer to flip your texture vertically when getting coordinates for the model (and flip again for UV coords). Why is this? Well, probably from some older technical limitation on how graphics cards worked that image editors adapted to, as now all image editors (and other stuff, like Flash) use this down-is-up system. Mojang not using this for UVs would just add confusion. Something to note. The top view gives you X&Z, and the front view gives you X&Y (if your model is too complex, you might want to make a side view, too). Well how do you get the coordinates from an image? Hover with your mouse over the pixel you want. There should be some sort of info in your image editor to tell you what pixel the mouse is over, such as in GIMP, it's on the bottom-left (below the horizontal scroll-bar). Choose from the top-left first. Why add 1? As I said, you aren't specifying pixels, you're specifying vertices. The beautiful thing about using one of your textures as a front-view to find coordinates is that the texture will likely use the same coordinates! Sometimes you may want to choose a texture from somewhere else, and in this case, remember that while the model coordinates are upside-down, the UV coordinates are to be used as-is. UV mapping still used vertex coordinates, so it's not much different than making the block model. Because it maps from (0,0) to (16,16). Important! You need to be familiar with JSON to work in this format. Whitespace is not important, however, commas and "containers" (curly/square brackets, quotation marks) are. ESPECIALLY COMMAS. Will cause the model not to work, because if there is more than one item, a comma is needed after all but the last. Also remember to pay close attention to where you are placing code to be in the right container, and make sure you have the same amount of opening and closing brackets/quotation marks. That's because (1,0) and (4,16) are taken straight from the same texture used to find the coords for the box model. This is useful when you need a texture, but there isn't a good selection in a horizontal space. So you've made some super amazing models (or you're trying now) out of cubes. Now what? Specifically, what do you do with those faces that are inside the model and you can't see? Man, the east and west faces aren't even visible, is there anything I can do to stop them from rendering at all? Something else you should do: set "cullface" to true on top/bottom faces (that will be obscured by blocks above/below them). To test this, go into spectator mode and fly under the ground, it will allow you to see what faces you can't see are rendering. With culling and removing faces lines (as shown above) you should try to eliminate all faces that you shouldn't be able to see. When you need to use the same model for multiple variants, possibly rotating them, inheriting them is the way. Quite simply, first you make a model to act as a parent. This can easily be done like any other model, only you leave out the texture paths at the top but leave the references in the faces themselves. Then you make another model that calls to the "parent" model and fills in the path for the texture references. Ground is for the dropped (floating) version of items, fixed is for item frames. 180 Z rotation is needed in 3rd person because they made 0 upside-down. 3rd person also needs to be scaled down, 1 is huge (normal block size). Scale of 2 is needed in ground/fixed because custom models typically look really small, especially non-blocks. Tip! You can remove sections of display you don't need! If you only need to fix the 3rd person display, just include that line. If you don't need to move the item, you don't need the 'translation' section! The texture is 8x8 but uses the whole thing. if you have a model-heavy pack, it can allow you to really clean up your pack. if you make your own custom folders for new/significantly modified textures and delete unused block/item textures, it makes it more manageable. try to use textures as efficiently as possible. Try to fit it into 16x (or whatever your resolution of pack), but if you have tons of extra room, you might want to make a shared atlas. For instance, I use plant_atlas_0 for mushrooms (both small ones), sugarcane, and wheat (all stages). There are the sample models, and more in my resource pack, Vivid Torrential Changes. If you wish to snoop around and see how I did something, go right ahead, but only use the models in your pack that I've released here. I will release more later, but please don't use models I haven't released. Helpful guide, and I learned I have been placing my UV in the wrong order. I think it might help to more clearly state that the coordinates refer to the corners of the pixels rather than the pixels themselves. In playing around with this I was quite confused about why the coordinates ranged from 0-16, indicating that there were seven pixels to a side. Also, I agree on the torches. Looks lovely. I didn't do this? I stated that you choose vertices not pixels/faces, showed a picture with green dots in the corner, and said that when choosing a coordinate to the bottom-right of a box (as seen if it were a selection in the image editor at least) to add 1 to each coordinate value like the pixel (15,15) becomes (16,16), isn't that clear? Hmm... So you did. I suppose I'm just not too bright when it comes to learning stuff like this. My apologies. Helpful! Minecart tracks, here I come! 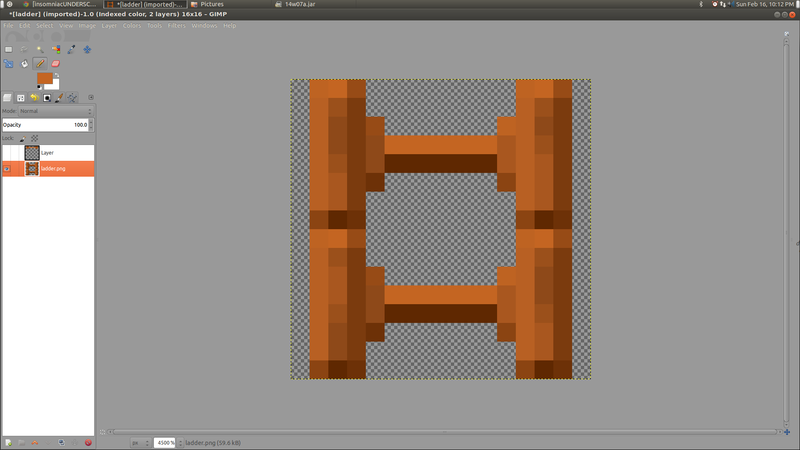 Yeah, I'd like to create a model for minecart tracks very similar to my ladder model. Sadly, we can't do anything like that yet, as 14w07a/14w08a don't have a model file for it. So it's looking like we'll have to wait until next week to see if we get more model files. 14w08a was released today (wednesday, huh?) and didn't add any more models. Dinnerbone said it's unlikely that we'll get another snapshot with more features this week. Huh, you mean when the model system is to a point where modmakers can use it to more easily make models for their mods? My big issue is photoshop don't show the type of coords that gimp does, and I don't know gimp at all. The coords it shows seem to be very picky on how wxact you are to each corner. I don't get how to make that grid show up like you have it. okay thats fine and all.. but how does that translate into the modle? What do I put in on 'from' and what do I place in 'to'? theres three numbers in each and none of this part is explained. The three numbers are the x, y, and z coordinates. The top down view of your ladder shows the x and z values and the front face shows the x and y values. For the top down view the origin is in the top left with the positive x going to the right and the positive z going down. For the front view the origin is in the bottom left with the positive x going to the right and the positive y going up. I like the canes and ladders. The top left of the entire image SHOULD be (0,0) so there's no issue there. The "from" is the corner where a cube starts, and the "to" is where the opposite corner ends. It's a bit hard for me to explain, but you've got to work with the 2D images to think about what it should be in 3D. To make that model, I did it point-by-point, saying, "well, I want to go from this corner here, to this corner, so I need the Z value from the top, and the X&Y from the front". I hope this helps..... I do need to explain it a bit better, but I had hoped that giving the numbers and showing them plugging in would be good enough for now. The first pixel is 0,0, not the top most corner of the first pixel. The next pixel across is 1,0 next pixel is 2,0 and so on. The red pixel is 0,0, the next pixel over as highlighted is now 1,0. So the first silver post goes from 1,1 to 1,5, +1, making it 2,6? @.x I much rather work in real 3D. So heres the deal. Screw xyz. What image, top or front, and what 'corner' goes to what number? is the first number the first pixel of the object in the top down? is the 3rd the bottom pixel of...something.. or.. what? 'Go from top of this, and bottom of that' only gives 4 of the 6 numbers that I see, 8 numbers if you count the 2nd number in the bunch. 1, 2... 1, 2... or is that 1, 6... I really don't know. X and Y from the front image. You don't know Z yet. From the top image. you use the Y coord as the Z coord. note that this will actually make the bottom-left metal post as the Y is reversed for image editors. 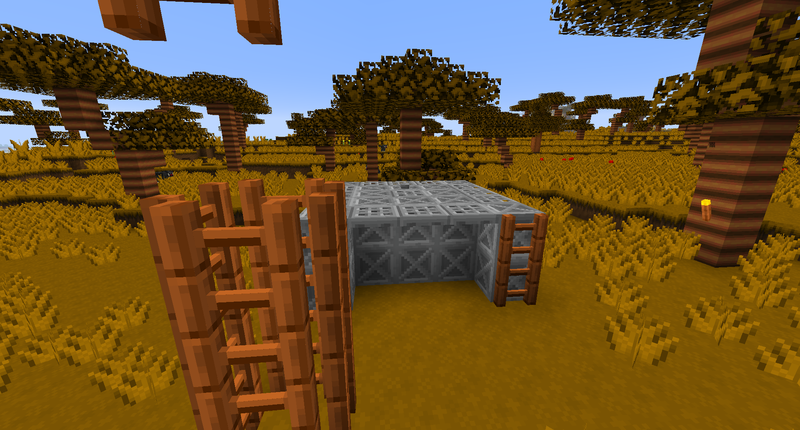 However, this won't matter as your ladder is symmetrical anyways, so it'll turn out the same. If you want your ladder to be as is (which is not symmetric or evenly distributed) flip the image before grabbing the model coords. But make sure you use the UV coords from the texture how you already have it. This tutorial has been really helpful to me. Thank you! However, this won't matter as your ladder is symmetrical anyways, so it'll turn out the same. Her*.... and so it is.... I wonder if that's intentional? It would cause a tiling error, though, well actually, they would need to be either 1 taller or 1 shorter to be equally spaced. EDIT: Removing the top "rows" of everything makes it symmetric and evenly distributed (and then flipping the top 2 pixels of the metal fasteners to keep their "cylindrical" shading. EDIT2: Found this on reddit..... would somebody who uses it mind linking this thread on there? what do you mean "left post" and why does there have to be multiple uv's? Ive been using multiple plane types with one uv on each. so the code is really long. is it necessary? and would you know of a program to do this automatically? Sorry for all of the questions. I'm really trying to get into this because they said this was also going to help with the modding api which is what im looking forward to and yes im creating a 3d ladder with my own texture. By "left post" I am referring to the left element of my ladder model, that's what I'm "creating" with the first box. Yes, it's sort of necessary to define the texture on every face. However, if you'll notice, on my models, similar faces all use the same texture, they don't need to be different. So you can copy+paste it (and change a few things) to make it easier. Sorry, I don't know of any tools. The format is still early days and might even change again next week, so people could make their own tools, but most will probably be cautious on doing so.